The North Gangetic Plains of India, Bangladesh and Nepal. The Ganges River is in the middle of the plains. 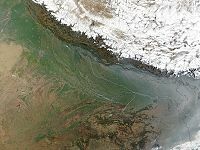 The Gangetic Plains is the large space of level land that is made by the Ganges River in the northern parts of India and the border surrounding areas of the Himalayas. It is an important part of the countries of India, Nepal, and Bangladesh. Its space of about 700,000 square kilometers or 270,000 square miles is the home of about 1 billion persons (about one in every seven persons alive today). Its western edge is the Thar Desert; its northern edge is the Himalaya Mountains, the highest mountains on Earth; its eastern edge is the Ganges Delta of Bangladesh, the largest River delta in the world; and its southern edge is made by the Vindhya and Satpura Mountains and Chota Nagpur Plateau of middle India. This page was last changed on 20 August 2017, at 19:17.